Stay with this article - even if you aren't a 'car nut'; this is stunning. Under full throttle, a top fuel dragster engine will consume 11.2 gallons of nitro methane per second. A fully loaded Boeing 747 consumes jet fuel at about the same rate, but with 25% less energy being produced. With 3000 CFM of air being rammed into the engine by the supercharger on overdrive, the fuel mixture is compressed into a near-solid form before ignition. Cylinders run on the verge of hydraulic lockup at full throttle. At the Stoichio-metric 1.7:1 air/fuel mixture for nitro methane, the flame front temperature measures 7050 degrees F.
Nitro methane burns yellow. The spectacular white flame seen above the stacks at night is raw burning hydrogen, disassociated from atmospheric water vapor by the searing exhaust gases. Dual magnetos supply 44 amps to each spark plug, which is typically the output of a small electric arc welder - in each cylinder. Spark plug electrodes are totally consumed during a pass. After 1/2 way thru the run, the engine is 'dieseling' from compression and the glow of the exhaust valves at 1400 degrees F. The engine can only be shut down by cutting off the fuel flow. If spark momentarily fails early in the run, unburned nitro methane builds up in the affected cylinders and then explodes with enough force to blow the cylinder heads off the block in pieces or split the block in half! 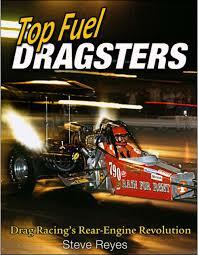 Dragsters reach over 300 MPH + ... before you have completed reading this sentence. In order to exceed 300 MPH in less than 4 seconds, a dragster must accelerate an average of over 4 G's. In order to reach 200 MPH well before reaching half-track, at launch the acceleration approaches 8 G's. Top Fuel engines only turn approximately 540 revolutions from light to light! Including the burnout, the engine must only survive 900 revolutions under load. The redline is actually quite high at 9500 RPM. THE BOTTOM LINE: Assuming all the equipment is paid for, the pit crew is working for free, and NOTHING BLOWS UP, each run will cost an estimated $1,000 per second. 0 to 100 MPH in .8 seconds (the first 60 feet of the run), 0 to 200 MPH in 2 seconds (the first 350 feet of the run), 8 G-forces at the starting line, and 6 negative G-forces upon deployment of twin 'chutes at 300 MPH. The top speed record is 332.58 MPH as measured over the last 66' of the run (2005, Tony Schumacher). Tony Schumacher had the fastest official speed in Top Fuel historyat the NHRA Arizona Nationals on February 23, 2018. Schumacher had a 336.57 mph run with a time of 3.667 seconds in his second pass after opening with a 3.649 at 334.65. You're driving a new $140,000 Lingenfelter twin-turbo powered Corvette Z-06. Over a mile up the road, a Top Fuel dragster is staged and ready to 'launch' down a quarter-mile drag strip as you pass him. You have the advantage of a flying start. You run the 'Vette hard, on up through the gears, and blast across the starting line past the rev'd up and waiting dragster. You're doing an honest 200 MPH. The 'tree' goes green for both of you at that exact moment. The dragster departs and accelerates after you. You keep your foot buried hard to the floor, hoping to coax at little more speed out of the 'Vette, and suddenly you hear an incredibly brutally screaming whine that sears and pummels your eardrums. And within a mere 3 seconds from the time you passed the dragster sitting at the starting line, it effortlessly catches and passes you. He beats you to the finish line, a quarter-mile down the strip from where you passed him sitting at the starting line - just four seconds ago. Think about it - from a standing start, the dragster had spotted you 200 MPH. And it not only caught you, but nearly blasted you off the planet when he passed you 3/4 of the way down a mere 1320 foot long drag strip! That, my friends, is acceleration.